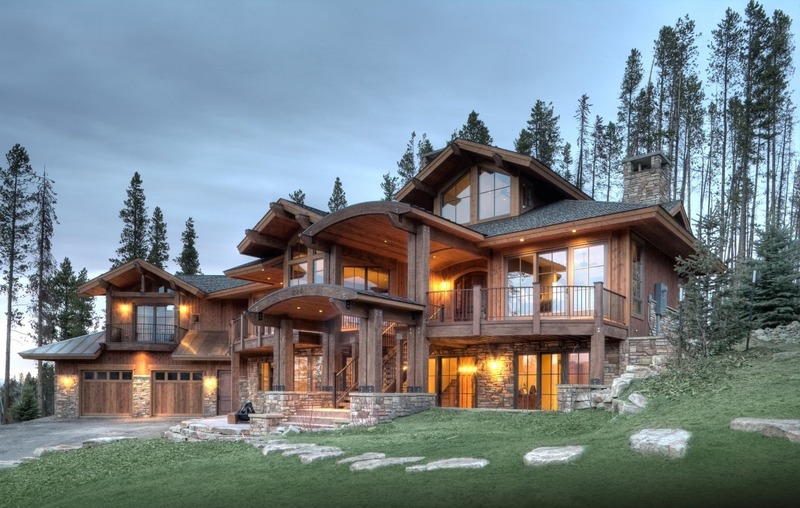 When it comes to building a custom home, there are quite a few stages to go through to make sure your dream home is built to fit your lifestyle. When you work with us as your builder, we help you through each of those steps. Here’s what you can expect with your new home build. Congratulations, you’ve made the first step to building your new home. It’s time for us to meet and really get to know what it is you’re looking for in your new home. We’ll need to talk through bedrooms, bathrooms, and square footage, of course, but also what specifically defines your new home, what our next steps will be and financial qualification for the budget. Afterward, we’ll work with you and architects to draw up your new home design. When we finally get to the point we have plans on the design, we can start with breaking ground. Our team works with Buildertrend, a complete general construction online organization tool that helps us better communicate with you on timelines, selections, photography updates, and budgets. You’re able to log in at any time and see the status of your home build. Before we can break ground, we must have design approval on architectural drawings, HOA approval, permits, and surveys. 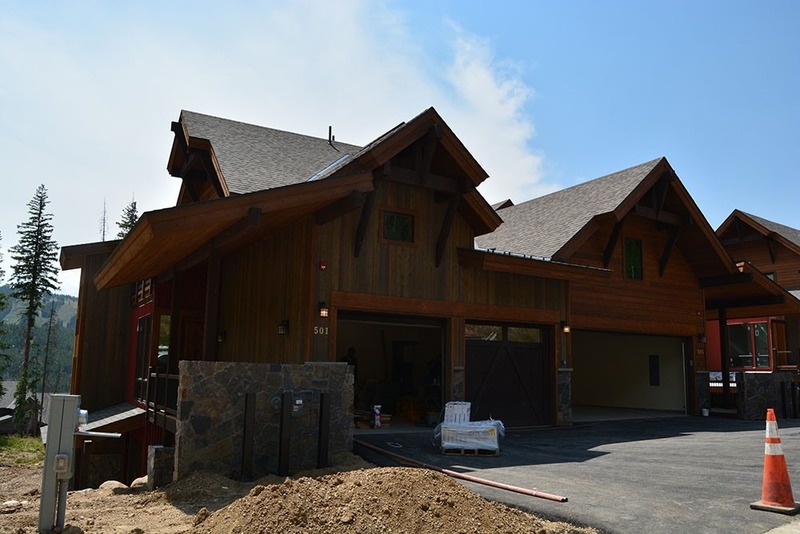 We also like to be upfront with what to expect from building a new, custom home. After reading through the steps of building a new home, we encourage you to read our part on “Expectations” down below. During this time, our team also does the legwork to ensure the right paperwork, permits, and certificates are in place; as well as ensuring our entire team stays within your set budget. As your General Contractor, we have a field team that builds your new home and an in-office team that works with you on what we call selections – tailored choices that will complete your home. Those selections include interior and exterior products – everything from stone, tile, and hardwoods to lighting, plumbing, and doors. Don’t worry, it may seem overwhelming at first, but all selections can be made in a time period that will not feel pressured and within your set budget. We’ll order all your selections and install them, so your home is move-in ready. On the constructions side, as simple as it sounds, our first step is to start digging. 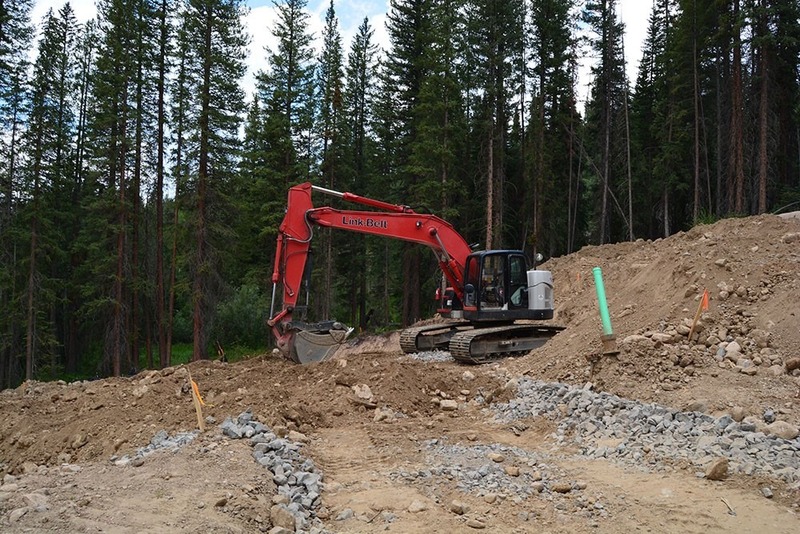 Construction: To be able to access the property, we start with building a driveway. We also make a ‘Limited Disturbance’ line (which means we’ll surround the property with hay wattles for erosion control and markup property boundaries), form a concrete washout, and display construction signage – all of which is required by town bylaws before we can go any further. Surveyors will be on the property to help with site preparation, as well. Once the above work is done, we can start digging. Selections: At this stage, decisions need to be made on plumbing. These selections must be made by the time we start backfilling. For the sake of placement for the plumber, kitchen and bathroom layout must be finalized at this time, because plumb lines are placed in the concrete and are final. Our field team continues to work on the progress of your home build. You can visit your new home at any time, but because it is a hazardous construction zone, we ask that you inquire with us beforehand so that we can walk safely with you through the home. As your home continues to be built, you can log into Buildertrend at any time – from any device – to see photography progress. You can also speak with your team coordinators to learn more about progress. Of course, at the same time, we’ll continue to communicate about any needed changes or adjustments you or our team may have. With construction, it’s time to start building the foundation and pouring the concrete. 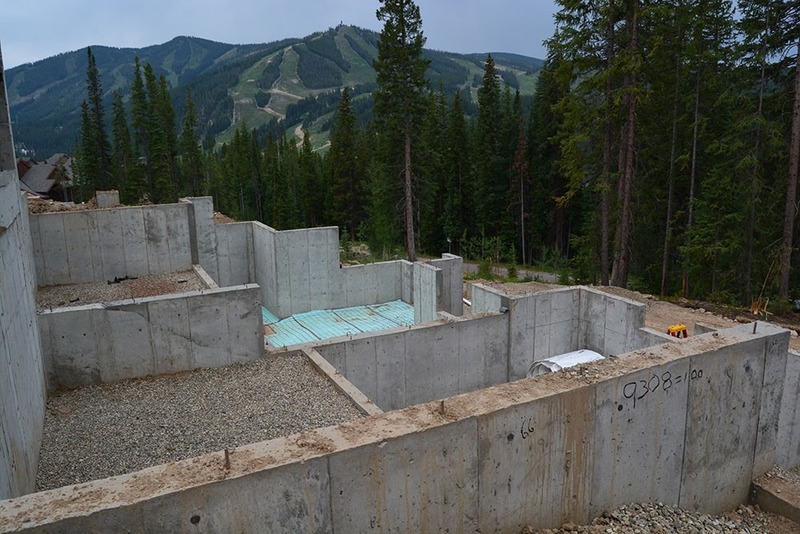 Construction: We begin by pouring concrete to form the foundation of the home. Once dry, radiant floor heating installers and waterproofing sub-contractors move onto the site. When that team is done, we backfill the foundation to push the dirt back-up, snug against the concrete. Selections: Upfront selections needs to start at this stage. These selections include appliances, cabinets, fireplace(s) and windows. Plumbing selections must be complete by this step. 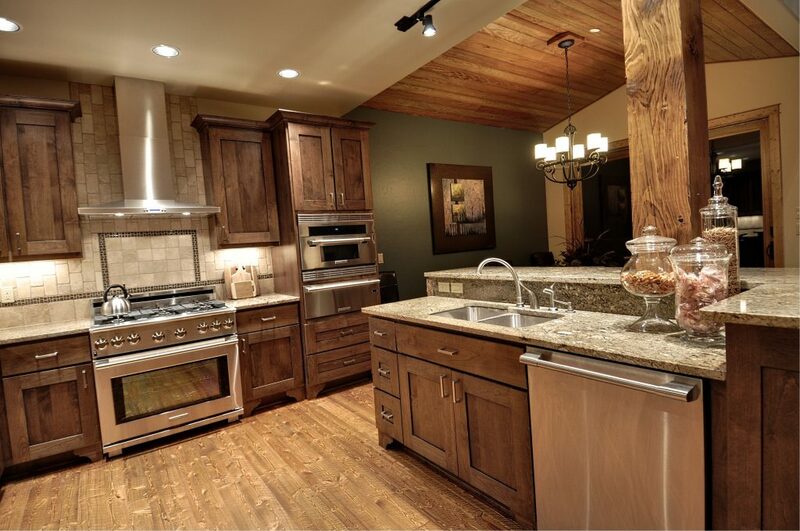 We’ll also work with you to finalize cabinet design so that plumbing and electrical can be finalized. Now, we can start with underground plumbing, steel installation, and concrete floor pouring over the radiant floor heating. 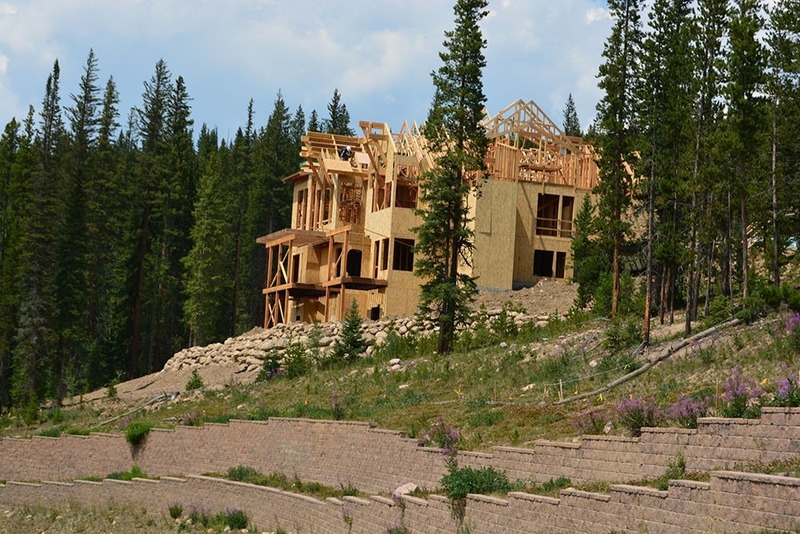 The longest stage in the home building process is framing, which can take multiple months to complete. Construction: Framing starts with rough framing, which is basically the shell of the house. Slowly though, that shell is filled in with beams, plywood, and roofing. The exterior of the home will eventually get to a stage where it can be covered in a protective house wrap called Tyvek. When the roof is in place, the home is considered dried-in. Selections: We have a few months during this step to put time towards selecting your final home finishes, but we would push to have all selections done during this stage before we moved on to the next step. Before moving on to the next step and after rough-in and mechanical trades are complete, an inspection must be done by the town to ensure compliance with building codes. Now that framing is well underway, the plumber can come in and start installing rough plumbing pipes throughout the house. Heating, ventilation, and air conditioning (HVAC) can be installed at this time too. After the plumber is done, the electrician can come in and will spend the time to install lighting cans and ventilation features in bathrooms and kitchen. The electrician cannot move forward with electrical wiring until after the house is dried-in, which happens during the framing stage. Before moving on to the next step, an inspection must be done by the town to ensure compliance with building codes. This inspection is called the State of Colorado Inspection for Electrical. When the house passes inspections, we can then start installing insulation, before moving on to drywall. At the end of the drywall step, we install the fireplace (or fireplace box) and texture/paint walls. If you walk the home at this stage, you’ll really start to see the house come together and get a better picture of what the final stages may look like. During this step, we work on exterior items like siding, stone, stucco, patios, and sidewalks. At the same time, we’ll have a team inside the house working on trim, stair railings, vanities, cabinets, doors, countertops, and more. We also install tile floor and install all of the plumbing fixtures during this step. And as much as it seems like a lot of work, these teams work quickly and usually get these steps done quickly. Carpet and appliances are installed last to ensure they stay clean and blemish free. The driveway final coat is also done last so that it remains clean for your welcome home. This step is followed by a final inspection. At this point, we’re close to finalizing the home build, which makes it an opportune time to walk through the home and attain a punch list to ensure everything that was agreed upon is done to your satisfaction. We’ll obtain the Certificate of Occupancy (CO) and have the house cleaned by professional cleaners before you close on the house. Project closeout is deﬁned to include the General Contractor requirements near the end of the building phase in preparation for final acceptance, final payment, normal termination of the contract, occupancy by the Owner, and similar actions evidencing completion of the work. All warranties and guarantees shall begin on the date of the Architect’s lssuance of Certiﬁcate of Substantial Completion unless otherwise speciﬁed in writing and approved by the Architect. Advise Owner of pending insurance change-over requirements. Complete start-up of all home systems. Submit special guarantees, warranties, workmanship bonds, maintenance agreements, final certiﬁcations, and similar documents. Obtain and submit Certiﬁcate of Occupancy (CO). Discontinue (or change over) and remove from the project site temporary facilities and services, along with construction tools and facilities. Complete changeover of locks and transmit keys to the Owner. Touch-up and otherwise repair and restore marred exposed finishes. Submit General Contractors complete punch list of work remaining. Submit operations, maintenance, and warranty information manual in a three-ring binder for Architect review. Time for closing! This is a very exciting time, as it means it’s time to get your set of keys and take ownership of your custom home! We will walk through the home with you and do a checklist to ensure everything is complete and that you understand how to operate everything from ceiling fans and HVAC to gas shut-off and lot drainage. We offer a limited warranty on your new home that runs a period of one year. Full warranty details will be provided to you in a separate document but include a 6-month and 1-year follow-up visit with our team at your home. During the limited warranty period, you can reach our team at (970) 726-9225 or [email protected]. The importance of ensuring selections are made on time is so that we can keep the construction of your home on schedule. At the beginning of the home building process, we’ll set expectations on when the home may be completed but making selections for your home is a big part of ensuring that the schedule stays on course. We have homeowners make selections in order of importance; for example, we need decisions made on plumbing first, because we need to know where plumbing pipes are going before we pour concrete… and because moving those pipes after concrete is poured can become costly for the homeowner due to change orders. Likewise, windows can take upwards of 5 weeks to be delivered; waiting on windows can greatly delay the construction of your new home. Moving walls, concrete, electrical, and plumbing can cause major setbacks. We work with you to finalize selections and selection pricing in a system we call Buildertrend. This program easily communicates selection progress. Once you sign off on your selections, we print a manual for our Construction Manager to review and hand out to our trades. A change order can seem like a simple change but is often quite significant and costly. This is because a change to something that is already built or designed means construction has to stop and take a step back, which adds labor and time and, often times, a full reconstruction of an area to ensure code is met. An example of a change order that may seem minuscule but is costly in price is the addition of a half wall. You may be under the impression this change would run around $1,000 to frame and finish the job, but the end cost will be closer to $5,000 because, in addition to the framer having to come back to the job, we would also have to bring in the electrician (because it’s code to install an outlet), drywaller, trim carpenter, and painter. Because of change orders and unexpected issues that may arise, it is recommended that homeowners have at least a 10% cash cushion. As it can take close to a year for a home to be built, there are expectations and responsibilities that must be defined for things to run smoothly. As we know that not all homeowners have gone through a home building process, we like to share expectations and realistic scenarios, so you better understand what could happen as your new home is being built. My home will be built in a month. Although we could all agree that building a house within a month would be ideal; in reality + it takes time. Some homes can take up to a year or more to be built. My home will be beautiful from breaking ground to closing. There is a long stage in-between your home build where your house goes through an ‘ugly duckling’ phase. That phase is typically from framing to closing. As your home starts to become a home + there could be nails + Tyvek + dust + holes + drywall + and other unsightly things. We always deliver an impeccably clean home at close… the mess will go away. There’s a hole in the drywall that will never get fixed! We’re working in a construction zone. Accidents + dents + dings + holes + and a lot more will naturally happen. The good news + however + is that we know how to fix them + and we’ll make sure everything is fixed before completing the house. I can’t wait to make selections for my home! Selections can be fun + but they can also be overwhelming at times. With so many selections to make + it’s easy to forget what has already been selected and if you really like your initial selections. The good news is that we use Buildertrend to keep track of all your selections. You can log in anytime and see the selections you have made + including images of those selections. If you’re having a custom home built + we’d suggest pulling images out of a magazine and keeping them in a folder + and mark on the images the things you like about the image. If you prefer to work online + Pinterest and Houzz are both great areas to pull together your selection ideas. All of these ideas make it easy for you to share your interests with us. There’s one team involved in my home build – this will be easy. There are multiple teams involved in building a home. There are real estate agents + General Contractors + you as the homeowner + and over 10 different trades teams. For a home build to go smooth + all those teams must work together. I can schedule my meetings to view the home on the weekends. Most of our walkthroughs are with trades and organizing weekend visits is very tough. Just like most organizations work Monday-Friday 9am-5pm + our schedules follow that same time frame. Building a house is stress-free. Although we’d love to agree with you + we often find ourselves reminding homeowners to remember the first meeting we had together and how excited they were. The euphoria you felt during that first meeting will be met again at closing and when you get to call your house a home. The in-between stages of the building can be stressful but making sure to take time to know the building process + attend meetings + and make selections on time will help. I’ll know the cost of my home before we start building. We call it a budget. We’ll know your allowance + but things like change orders will add to a budget increase. Plan + plan + plan – upfront planning can help with ensuring the entire team stays in budget. Backfill. Refilling an excavated hole with material pulled out of it. In the case of your home, it would mean pushing the dirt that was dug away back against the poured foundation. Certificate of Occupancy (CO). Before a homeowner can move into a house, the house must obtain a CO, and a CO is only issued after the town does an inspection to ensure the house is suitable for occupancy and passes all building codes. Change Orders. These happen when work is added or deleted from the original scope of the project. Change orders occur with almost every home build. Closing. This is when you finalize the real estate transaction of your home. Concrete Washout. Because homebuilding involves concrete, General Contractors are required to have concrete washouts at job sites so that there is a safe area to wash concrete tools and vehicles. A concrete washout contains water for cleaning but is leak proof so that the waste does not reach soil or groundwater. Drawings. These are your architectural drawings (also referred to as plans or blueprints). They are used throughout the home build and are often found in the General Contractor’s office, the architect’s office, with the HOA (if any), and at the home build location. Egress Window. This is a basement window(s) that allows for escape in case of emergency. Limited Disturbance. This is an area around the build site that we are required to mark off to ensure everyone on the job is aware of the construction zone. Punch List. This is a document that we fill out towards the end of the home building process. We walk through the home and look for incomplete or incorrect installations or damage to finishes. Selections. These are the choices you make of the items that will be used to make your house a home. It’s everything from lighting fixtures and bathtubs to tile and cabinets. Trades. From carpenters and electricians to welders and laborers, these are the different team members involved in building your home. Also, commonly referred to as the construction crew and sub-contractors. Tyvek. A protective house wrap that goes between the plywood/insulation and siding layer of the home. It is meant to be an air and water barrier to help protect the home from mold and wood rot. Water Closet. This is a room containing a flush toilet within a bathroom – the room may or may not have a door. Wattles. These are round straw bales that are installed for erosion control.